In the framework of the AII Montenegro Chairmanship, on the 16th and 17th of April took place in Budva the ad hoc Round Table on “Strengthening integrity in State Authorities and Electoral Processes in AII Countries”, organized by Agency for Prevention of Corruption (ASK) of Montenegro with the support of the US Embassy in Podgorica. All AII Countries were duly represented, which denotes the raising awareness of the contemporary society in the AII Countries on this sensitive issue. The introductory remarks have been delivered by Mr. Sreten Radonjić, Director of the Agency for Prevention of Corruption (please find here the speech in original language), Ms. Marijana Laković-Drasković, Director General for Organization of Judiciary, Criminal Legislation and Supervision - Ministry of Justice of Montenegro, and Ms. Goranka Vučinić, President of the Council of the Agency for Prevention of Corruption. The ad hoc Round Table offered experts belonging to national independent authorities dedicated to the prevention of corruption, the opportunity to share experiences, methodologies, solutions on corruption risk assessment and management, in corruption prevention and treatment in the frame of their respective legislations. The meeting resulted to be a very constructive exchange of ideas on common challenges such as National Integrity Plans, transparency as well as training and capacity building. On the second day, experts discussed about the control of financing of political entities and election campaigns, which is another very important topic and delicate matter. They also reported national experiences from Greece, Serbia and Montenegro, highlighting the importance of data collection, reports, adoption of new technologies and IT solutions in order to tackle and deal with such an important issue. Furthermore, the prevention of corruption assumes a certain importance for AII countries, which are not yet part of the European Union, considering that anti-corruption policies are part of the negotiations in order to access to the EU. Ultimately, the message arising from the meeting was that integrity, transparency and combating corruption must be part of the everyday culture and become fundamental values to be achieved. 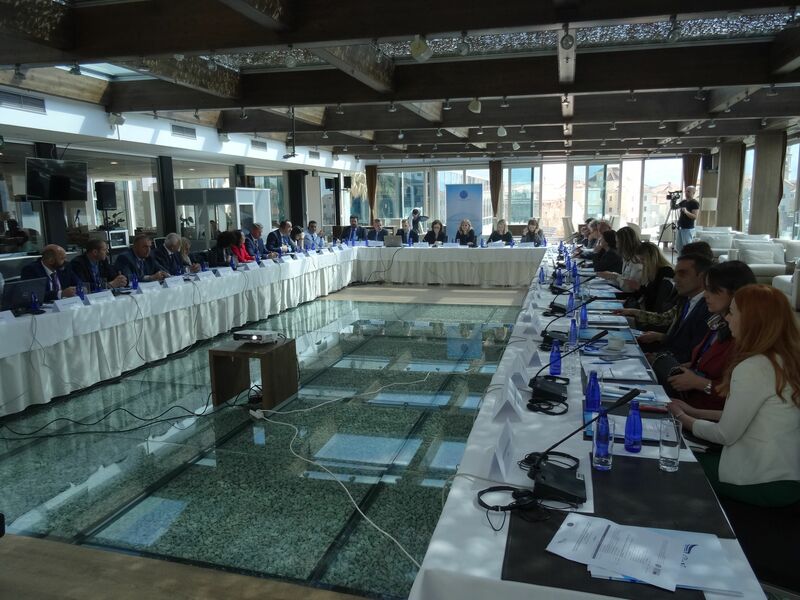 The Ministerial Conference on strengthening the regional and Adriatic-Ionian cross cooperation in the field of youth, organized by the Ministry of Sport and Youth, with the support of the OSCE Mission to Montenegro, within the framework of the AII Montenegrin Chairmanship, took place in Budva on April 4-5, 2019. For the first time, the Conference gathered ​​youth policy representatives from AII Participating Countries, with the aim of intensifying cooperation in the above-mentioned area, bringing together more than 50 representatives of the countries of the Adriatic-Ionian Initiative, international and regional organizations, domestic institutions and non-governmental organizations. The meeting has been opened by the Ministry of Sport and Youth, Nikola Janović, which underlined how the AII promotes economic and social growth in the region, as well as European integration of the Western Balkans. "Through close cooperation with the countries of the region as well as Member States of the European Union, Montenegro actively participates in the definition of priorities that are important for the entire Adriatic-Ionian region. In all areas of common interest at regional level, it is necessary to work diligently and consciously to improve the conditions and create opportunities for young people", Janović said. Ambassador Maryse Daviet, Head of the OSCE Mission in Montenegro further emphasized that the OSCE recognizes the importance of working with young people and the very important role they play in building a peaceful and secure environment. "The Montenegrin chairmanship of the Adriatic-Ionian Initiative has been very successful, and I would like to congratulate you on the efforts you are making in developing partnerships with all the countries of the region," said Ambassador Fabio Pigliapoco, AII Senior Advisor. An event which has further underlined how enhancing sustainable regional cooperation amongst youth, and establishing new relations amongst young people in the Adriatic and Ionian area, by fostering reconciliation and by promoting the European spirit of cooperation, understanding, and tolerance, is pivotal to give a brighter future to the Adriatic and Ionian Macroregion. Minister Janović concluded that this event has been an opportunity to discuss key challenges and achieved results, as well as to exchange experiences among the countries of the region regarding the improvement of the position of young people. The traditional annual event aims to raise visibility of the EUSAIR and reflect on the progress made since the 3rd Forum held in Catania in May 2018. The 4th EUSAIR Forum will focus on the topics related to the field of Tourism and Blue Growth. The participants will also have the chance to discuss funding mechanisms for all four thematic pillars of the EUSAIR and share concrete ideas on the future prospects of the Strategy. Each year the Forum attracts numerous stakeholders, such as European Commission and other EU institutions, National ministries, Regional and Local authorities, Business sector, Academia and Civil society, who share views, exchange experience and discuss ways of cooperation. 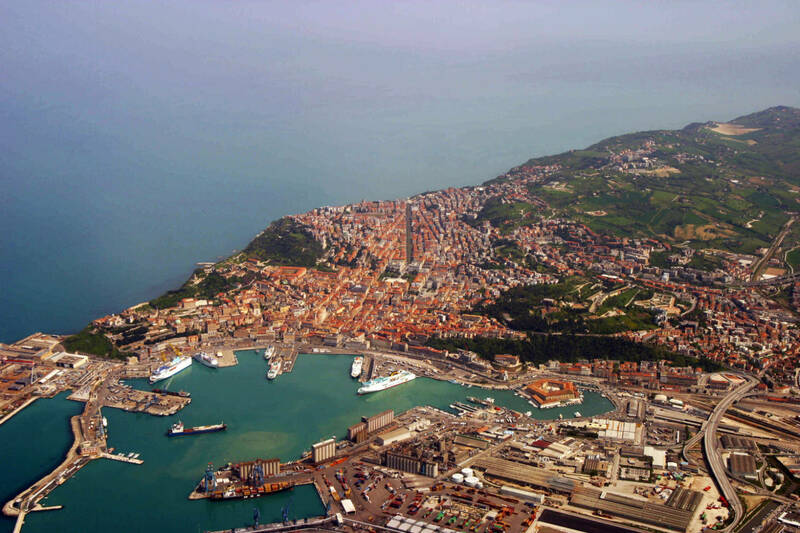 Two Forums will be preceded by the Adriatic and Ionian Council/EUSAIR Ministerial Meeting (event reserved to Ministers and their delegations) and other side events on 6 May 2019 (ADRION Annual Event, Facility Point Workshop with journalism students, etc.). Side thematic meetings and cultural and social events you can find in the event programme draft. Detailed information on Concept Note can be found in the 4th EUSAIR Forum Handbook. You are kindly invited to join us at this great networking opportunity and contribute towards further implementation of the EUSAIR Strategy. 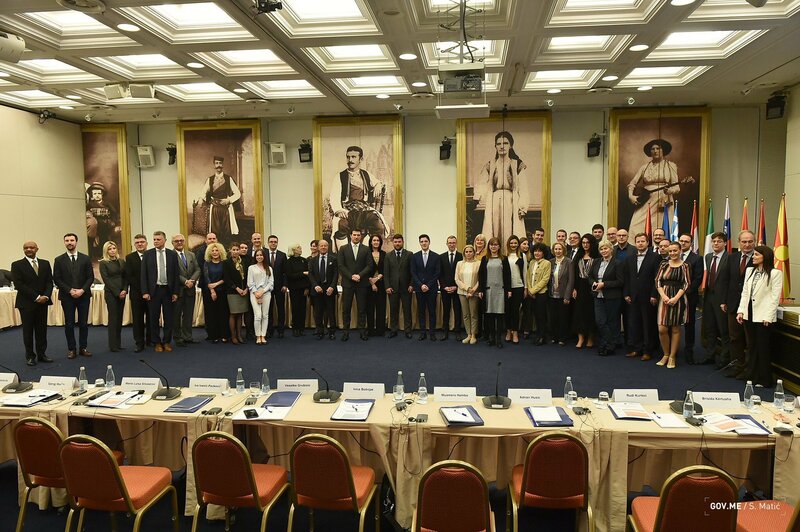 The AII Round Table on Tourism and Culture took place in Podgorica on April 4, organized by the AII Montenegrin Chairmanship in cooperation with the Ministry of Sustainable Development and Tourism and the Ministry of Culture of Montenegro. Within the framework of the Round Table, two panels were held, during which representatives of the public and private sectors presented the importance of cultural tourism for tourist destinations and its further development. On the panel entitled "Interdependence of Tourism and Culture in the Adriatic-Ionian Region", participants discussed about the Cultural Tourism Development Program, the impact of digital technologies, as well as story telling models in the interpretation of heritage along cultural and tourist routes. Likewise, the socio-economic impact of cultural tourism on local communities and the improvement of tourism statistics in the field of cultural tourism at regional level were discussed during the panel. On the second panel entitled “Cultural tourism in relation to UNESCO World Heritage Site“a case study "Stećci - medieval tombstones" was presented. This is a case of regional cooperation among four countries, Montenegro, Serbia, Croatia and Bosnia and Herzegovina, which together classified sculpted, medieval tombstones to the UNESCO World Heritage List. According to the regulations of the AII Round Tables overhauled in 2015, the results of the Round Table have been transferred to the 10th Thematic Steering Groups 4 on Sustainable Tourism, which was held back to back with the AII Round Table. 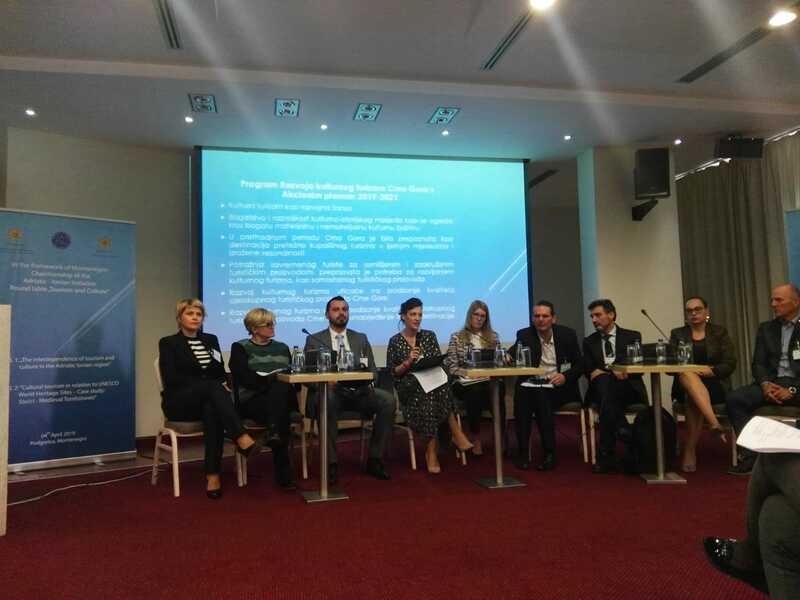 In this regard, showing the strong connection between AII Round Tables and EUSAIR TSGs, Blanka Belošević, Coordinator of EUSAIR Pillar 4, took the floor in order to underline this important link. Please find here the Agenda of the event. 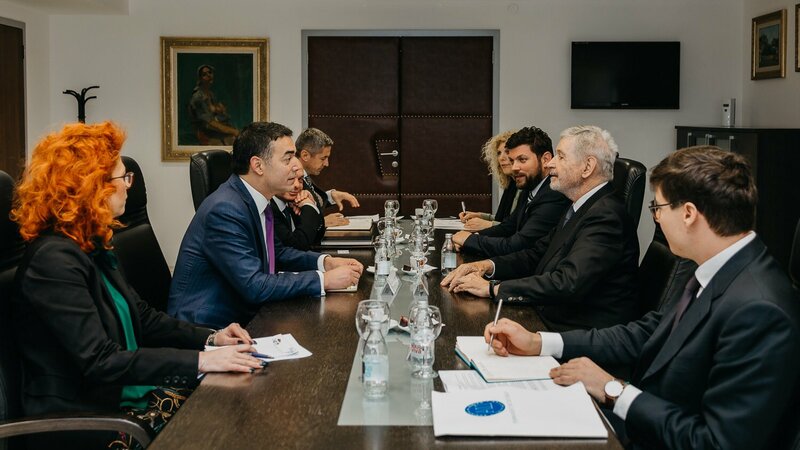 It has been held on the 27th-28th of March 2019 in Skopje the joint official visit of the AII Permanent Secretariat together with the Montenegrin Chairmanship to the new AII Participating Country – the Republic of North Macedonia. The strong role of the AII in enhancing regional cooperation and good neighbourly relations, instrumental to open the path of the European integration process to candidate and potential candidate countries. EUSAIR STAKEHOLDER PLATFORM NOW AVAILABLE ONLINE!